Creating new artwork is always a little scary. So many things go through your head. Will this series be any good, will people like it, will they like my old work better, is it recognizable as my style, does it mean anything? It’s no wonder so many artists get blocked. I am starting to create a new body of work for an upcoming exhibit in April. Its new, different and a bit daunting to work on. It’s very personal work influenced by the past few years of my life. In addition to the personal influence and inspiration of the work the medium is going to be different than my typical as well. My past work has mainly been photo based; woven, painted, transferred or other techniques. Photography has always been the focal point with other media complementing it. The past few years though, I have been working more and more with encaustic and book arts. Working with wax and paper feels very natural and fulfilling. I have become very fond of creating and experimenting in sculptured, layered and textured work.Photography will always be my first love but I feel that it is receding into the background a bit. Instead of being the main element it may just be an addition complimenting the main mixed media work or not included at all. So, new very personal work that's not photo based, needless to say I feel very vulnerable about creating and exhibiting it. I am enjoying the process though, it’s not all fear and panic. I love being an artist and being able to create and express myself through art, it can be a very cathartic process. Below is a sneak peek at a work in progress. Take your photos to new level by learning to combine the ancient art of encaustics with modern photography and printing techniques. This workshop will cover paper use and selection, mounting techniques and materials, encaustic pouring, painting and photocopy transfer techniques. Proper tools and safety procedures will be discussed. Great for photographers who want to add another option for their clients or anyone who wants to giv their photos an artistic painterly touch. All materials included and all levels welcome. Students will go home with 2-3 finished pieces and a goodie bag. Class limited to 5 participants. Encaustic is the art of painting with hot bees wax. This hands-on workshop is a great introduction to encaustic painting. Learn the basic techniques of encaustic painting including the history of the media, materials/safety concerns, heating tools and fusing techniques, layering, masking, stenciling and other techniques to create beautiful works of art. Instructor will provide all materials and students will go home with a sample technique board, resource list, instructional handouts and product samples. Class is limited to 5 students. In this class students will learn image transfer techniques for paper arts, collage, fiber arts, and more. Explore transfer options such as Xerox Transfers, Packing Tape Transfers, Inkjet Image Transfers and more using inexpensive materials. Students will go home with a variety of samples made in class. I will be exhibiting a whole new body of work entitled Selcouth. 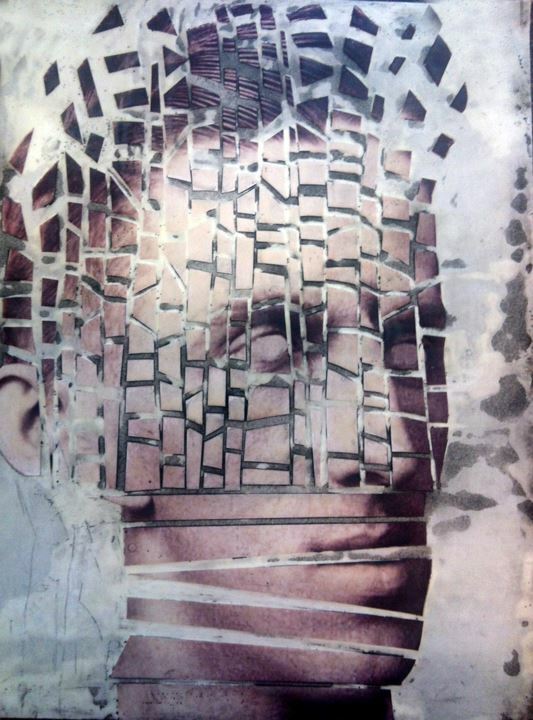 Each photograph is hand woven and layered with encaustic and oil paint. I'm a collector of the odd and beautiful, the repulsive, rare and mysterious. Objects that occupy the space between familiar and bizarre. This series comes from place of discovery and wonder where insects, art, specimens and other objects can come together and tell a story. By interlacing art, science, and culture I explore the connection between man-made and natural objects; evoking a sense of nostalgia for the classic age of exploration and discovery. I am so excited and honored to announce that my photograph (see the post below) was awarded 3rd place in the Triton Museum Statewide Photography Exhibit & Competition. According to the museum there were nearly 700 entries and there was only 75 pieces chosen for the actual exhibit. Out of those 75 they awarded 1st, 2nd, & 3rd place prizes and a few honorable mentions. I was just happy to be a part of the exhibit, you can imagine what a wonderful surprise it was to attend the reception and see the plaque next to my image with the announcement. Recently one of my photographs was chosen to be in the Triton Museum of Art Statewide Photography Competition & Exhibition. I am very honored and excited to be part of the exhibit. The juror was Brian Taylor a wonderful photographer who I really admire and look up to. The show opens Friday the 24th with reception from 7pm - 9pm. The piece that was accepted is one of my new hand woven pieces. It is a 20x20 hand woven photograph layered with encaustic wax and oil paint. It is a green lady-slipper orchid. Here is a link for more info about the exhibit.